The following interview is with Kathleen Wieland, interviewed by daughter Vanessa Wieland (age 35). I lived up on Grandview [Newport, KY], “the house up on the hill.” We bought the house in 1972 for only $12,500, in the same neighborhood we were raised in. We had two children, our dog Princess, the stray bird your sister found, Baby. We had all our friends, Grandma and Grandpa down the street. Our neighbors Marge and Jack, who were just like family, and Mickey and Linda across the street. We used to have our famous street parades on Memorial Day! [laughs] We got insulted because Channel 12 News wouldn’t cover our street parade. It was home. I was comfortable, and it felt safe. We didn’t lock our doors or anything because we knew everybody. We lived in Texas for two years when I was 20 and 21 years old; your daddy was in the Air Force. In Texas I was by myself, lonely. There was nothing to do because I was stuck on the Air Force base. No telephone. I had to grow up real quick. [In] Newport, we lived a sheltered life up on that hill. There wasn’t the drug scene up there. And I’m still best friends with the same people. So are our kids. Two of us have buried husbands; we still do stuff together, go on cruises. And we were all from the same neighborhood, pretty much. What did you do for a living and what was a typical day like? I was working part time at Kmart, your daddy was working at LM Prince. At Kmart, I was doing part-time stock from 7 to 11 in the morning, putting stock away, and then on Mondays, I went straight to the school and helped in the lunchroom. We lived in a very small community with a small [Catholic] school, only 88 kids in the whole school. I worked the bingo on Thursday nights; all parents were required to work it. We did stuff at church. I was sewing a lot, making a lot of clothes. I sewed a lot of wedding and prom dresses. Maureen went to prom her freshman year with a senior; we thought that was so exciting! And sewing the occasional dress helped supplement our income. We ate a lot of pasta. I cooked dinner every night. We just lived the American family thing, we were boring! [laughs]. We had nice Christmases. I made clothes for you kids and for your dolls. We spent time with our friends a lot. Shirley and Steve and their kids would come over every Saturday night and we’d watch Saturday Night Live while you kids played. I bowled on Friday nights. We went to museums and on vacations. We rented cabins in Kentucky. You went through Shaker Town in ten seconds, you were so bored. What did you worry about, or think about the most? Finances, always. I didn’t really worry about crime. My parents aging, my father’s diabetes. He was 48, 49, something like that when he had his first heart attack, and that worried me. That was, what, 1982? 1983? The war was over, but inflation and the prices were a concern. Reagan was president. How did you feel about Reagan? I think I voted for him, I’m not sure. Sally Ride was the very first woman to go into space. We women thought that was cool. Oh, and Grenada was going on, I think, because of the coup. But nothing felt really close to home. Groceries, the mortgage … typical family things. Oh, I think that was when there was a toilet paper shortage! But gas wasn’t high, then. A 1979 red Oldsmobile Cutlass. It was a big old thing, a maroon color. We bought it brand new. Your daddy had a Dodge Omni. Raising kids. Growing old together with my husband. That didn’t happen, but … [laughs]. What did you dream about, then? I always thought about writing children’s books. I love to tell stories. What would you tell your then self, if you had a chance? Maybe not marry so young, get an education first. But that was earlier, really. At 35—I don’t know. Slow down, maybe. But life was good. I enjoyed raising you kids, and actually growing up with you kids. 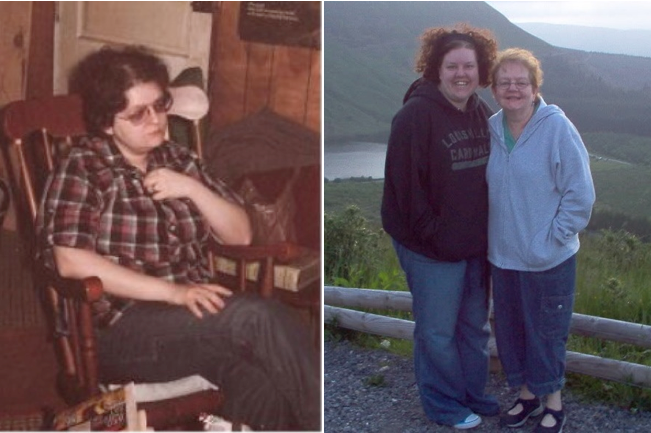 At 35, I was heavy, always worried about my weight, always on a diet. I’d eat better. THis is a great tribute to Kathy!! Every word is true, especially the storyteller part! Thanks for sharing!